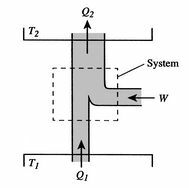 Typically the thermodynamic system in a refrigerator analysis will be a working fluid, a refrigerant, that circulates around a loop, as shown in Figure 3.7. 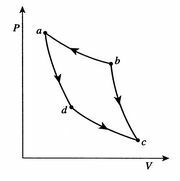 The internal energy (and temperature) of the refrigerant is alternately raised and lowered by the devices in the loop. The working fluid is colder than the refrigerator air at one point and hotter than the surroundings at another point. 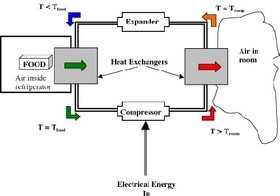 Thus heat will flow in the appropriate direction, as shown by the two arrows in the heat exchangers.